I am a little skeptical of how we can be so sure of the cyclone activity in, say, the year 900 AD. But nonetheless, the study is worth a look. Haig et al took stalagmites from two places in Australia (Chillagoe, Qld, and Cape Range, WA) and got very nice long year-by-year records of 18O and 16O data. They calibrated these against observational instrumental records — though I note these are but a tiny 20 years of data (1990 – 2010), and that during a period described by mainstream climate science (cough) as “unprecedented”. Assuming that it is possible to pick apart normal rain and cyclonic rain, and that cyclone activity did not just shift to be more than 400 km away (where these stalagmites won’t record the cyclones) then it does appear that there are usually more cyclones in Australia than now. Note the top graphs are the WA site which go back to 500AD, and the lower pair are the QLD graphs “only” going back to 1300AD. Both graphs show an increase in storm activity during the Little Ice Age around 1700AD. If things do get cold in the next 20 years, will we get more cyclones and will fans of man-made global warming still be blaming CO2 if we do? The paper has the usual obligatory vague claims pretending to connect this to anthropogenic causes, when there is nothing definitively unnatural shown in this long study, and given that the Earth has 1500 year and longer cycles, the long data is still not long enough anyway. We all know the debate is over and the science is settled, but note the 95% certainty is not quite evident in the conclusions (see my bolding). whether this downward trend in activity will be sustained. These waffly phrasings of uncertainty will be studied one day as a comment on the politically distorted scientific culture of the early 21st century. There are a couple of caveats, one is that normal rain and cyclonic rain are difficult to tell apart. The other is that these stalagmites can only record cyclones within 400km of the cave. Figure 1 below shows a map of Australia with the two sites marked. The circles around the two centres are 400km radius, so all of the cyclones that track beyond those circles are not included. During the last 20 years, the two circles are very well located, but I wonder if weather patterns shift and cyclones simply move elsewhere. The black squiggly lines are the tracks of cyclones that wouldn’t register in these caves during the last 20 years. during the training period in Queensland and Western Australia are shown in black. Red shading indicates the coastlines most prone to tropical cyclones in both states. a, Tropical cyclones from the 1990–2010 training period and their corresponding Kt value (point size), showing the influence of Vmax, Rmax and distance; cumulative Kn,t values are shown in colour. b, Point size indicates Kn (individual storm averages) calculated from a and subsequent seasonal CAI values (gradated colour). h/t Fred, and Robbie. And The HockeySchtick. 212 comments to Australia has lowest number of tropical cyclones in 1500 years? Do I detect a reverse hockey stick at the end of that graph? Possibly, but that should not be taken as being indicative of the overall number of cyclones. It is only indicative of systemic change. This study is geographically constrained by the two source locations, which lie between longitudes 15o, and 20o South. Cyclones that track further north, or further to the east of those sites, will not necessarily register. If things do get cold in the next 20 years, will we get more cyclones and will fans of man-made global warming still be blaming CO2 if we do? Yes it will still be blamed on CO2. This, despite that even the IPCC admits that there can be no AGW-attributed increase in bad weather without the intermediate step of an increase in Earth’s average temperature. ..petition from a couple of weeks ago. I suppose Fox News actually read the IPCC’s documents that clearly state “warming will continue”. All the graphs include temperature rises. All news items say “increasing temperatures”. All the red trend lines on temperature anomaly graphs go “up”. I can see how that might have confused Fox News, who actually thought words had meanings, graphs and trend lines had meanings, and used those meanings. Until now, I used climate change, but as noted, I will only be using “global warming” and encourage everyone else to do the same. Some interesting lines of research there. Was it peer reviewed? So peer reviewed is as good as other research? Ummm where is this other research and how do you rate it? You really can’t get your head around the fact that an intelligent person reviews the literature themselves. They don’t parrot. Some times (many times?) it is better. Well, the ‘peer review’ system for yesteryear’s eugenics and today’ climate science is pretty much the same. Lots of people think it is a good system, seems like you’re one of them. The abstract linked to above shows that it was accepted by Nature, a peer reviewed journal, 14 November 2013. Apologies – reading the conclusion, I now see that they want the graph to go down. So obviously a reverse hockey stick would be an unusual trend (probably bogus) that goes against your desired outcome of the researcher, whereas this is instead a negative trend hockey stick – a real hockey stick where they are just missing the PR trick of making the trend head away from the axis. I guess we must have paid for this! Where is the study which proves Stalagmites actually do what they say? While I’m quite happy to agree that the number of Cyclones in WA seems to have decreased since I arrived in 1969 I would want some validation for their basic assumptions. This post helps to highlight how little we really know about the history of our planet’s climate. If the planet is really warming significantly, then in theory the tropical rain belts should expand both northwards and southwards from the equator, which should mean more cyclones in Australia now than a century or two ago. However, global warming – assuming it exists – will be felt most in the polar regions and least in the tropical regions. So a change in cyclone activity may not mean much. Not knowing exactly where these stalagmites are located, a relevant comment may or may not be that a couple of farmers pumping up underground water for their crops and livestock, could have a major impact on local stalagmite formation. Anyhow, most important of all, there is not a damn thing we can do about the level of cyclone activity, regardless of what the ecoloon establishment might say. Peter,don’t stop there,there is not a damn thing we can do about any of the so called problems linked to the weather. That is except get in out of the rain, shovel the snow off your sidewalks, and don’t drive fast on icy roads. If it is cold, turn on the heat. If it is hot, turn on the air conditioner. As well as many other other acts of technological adaptation in response to actual conditions. However, the goal of the climate alarmists is not living their lives, it is preventing YOU from living yours at any level above that of an earth worm. Even then, you are not allowed to harm the earth worm who’s dwelling you are supposed to share. Earth worms supply valuable waste. Global warming alarmists cause considerable waste. The difference is the waste. The type of waste is pretty similar though. What you can’t say the word Sh*t? Me mum taught me to be polite.. and block out naughty words. Cyclone Dylan did not meet the criteria of low centre pressure and high wind/gust speeds. It was declared a cyclone cat 1 on Thursday noon, increased to a cat 2 as it crossed the coast at 3am. Cyclones normally slow as they pass land. The BOM on Jan 29th gave this chart. The BOM on Jan 30th gave this chart. And finally on Jan 31st they gave this chart. A super dupa computer, heaps of expert climate change data readers, etc, and they only give data as it’s happening. All predictions were WRONG. But then this is not peer reviewed, so not acceptable. But then the facts have to leave to make way for many incompetent BOM predictions. Three blooody days, and all wrong, the pseudo cyclone headed south and fizzed out. Incompetence at it best, well done BOM. Fools. What are your opinions on Yasi. The ABC reported it a Cat 2 that evening when it made land fall. Whoever built that 2-car garage that survived the Cat 5 intact should buy this pic and use it as an ad. I thought the same about Haiyan. Sure, the areas that copped the storm surge looked like you’d expect after a tsunami. But Tacloban Airport had the walls up with the roof half lifted. Didn’t stack up to me. They might have to edit that old shed and carport to the right. I’ve seen a whirlwind (larger dust devil maybe) pull a couple of sheets of corrugated iron off of an old shed like that. The 2-car garage still has guttering – often the first thing that comes off. Unsurprising that the doors blew in or blew away. Door codes inadequate and are being revised. Same type of doors in Florida have a much higher wind resistance. I was watching Haiyan on radar, it was tracking towards an area of coastline where the storm surge could not escape fast enough, that’s why the water was reported in the palm trees and obviously Tacloban City suffered damage similar to a tsunami. 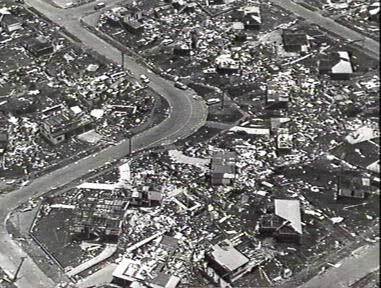 Its 350 kilometre per hour winds killed over 400 people, the largest death toll in any natural disaster in Australian history. They stopped at 170-5 km/h gusts, not sustained winds. This is Cat 2 bordering Cat 3. The ten minute sustained winds also reached the high 120s, bordering Cat 3. I was looking at the data of the two closest stations to the eye that evening and checked in the morning. Yasi hit the same area as Larry had in 2006,and the rebuilding after Larry was all to at least category three standard. Both crossed the coast some distance north of Cardwell. Unlike Tracey, which hung around Darwin for several hours, Yasi passed relatively quickly. The reason for the severity of damage in Darwin was the time the battering lasted. Nonetheless, if Tracy hit Darwin today there would be much less damage because Darwin now is not Darwin 1974, just as Cardwell 2011 wasn’t Cardwell 2005. You should try to find some images of Innisfail after Larry and compare them to Innisfail after Yasi- no comparison, though Yasi was the much bigger storm. The point probably should be that instead of trying to improve the weather we should be spending our money on better buildings. At least that way we get something for our money. If you look at the pictures supplied, the buildings are probably 70s. I doubt that the grey shed was built recently to Cat 3 standards. The post of Ken’s is good reading, yet I still think he is being quite generous to BOM. I’m not sure how much the length of time a cyclone is in an area matters a lot. Tornadoes go through very quickly. A sustained wind of 200 km/h means that it will be blowing for 10 min and gusting higher. There is the problem also of how earlier cyclones were rated. If more emphasis was given to actual wind readings then estimates from satellite information and damage done on the ground, then ‘storms getting more intense’ is very subjective. In addition we have the “arse about face” hockey stick … one in which the bogus trend is cobbled on before the handle. Then there is the “fat-clown” hockey stick … which is the analogy of a clown with enormous feet lying on the ground … and e.g. the medieval warm period is their stomach. Tiny differences in 18O that constitutes 0.2% of the oxygen isotopes. Some of the oxygen is from the original limestone and carbon dioxide. The difference between cyclones and monsoonal rain (tropical depression?) on average is 6%. What is the difference as function of distance from the eye? Is this water from the cyclone or a rising water table? Is it assumed that nothing penetrates the previous layers? ABC News tonight quoted an official Bureau of Meteorology (BOM source) as predicting another 3 or 4 tropical cyclones to hit Queensland this summer. Watching and counting with genuine interest! And eleven total for Australia? Good luck with that one BOM. Heh, would ya look at that. A Medieval Warm Period right around 900AD. And it’s almost as low as the current warm period in cyclone activity. We’ll have to deal a mortal blow to this proxy study. The paper and data was brought to the attention of the cyclic analysis wizards at Tallbloke’s Talkshop yesterday, so with any luck the series can be tested for deterministic cycles (and possible astronomical origins) in due course. Wooly thinking, without defining the terms. Is tropical cyclone inactivity just part of the ever-changing climate? Yes, what exactly do they mean by “climate change”? AGW? Natural shifts? What? It’s sloppy. It is far worse than being simply sloppy. Actually, according to their notion of climate, climate is supposed to be stationary. What the climate was before man started burning significant quantities of fossil fuels was the ideal stationary climate. ANY change in the climate is therefore attributable to man’s burning fossil fuels. Hence we must abandoned ANY use of fossil fuels so we can return to the Paradise Climate before fossil fuels were used. The science is settled. The consensus of climate scientists has been establish. Please send more money for us to do more research. This is all packaged inside of their use of the words “climate change”. Very little of it has anything to do with climate, measuring climate, or even defining what they are talking about. The important thing to them is that you will have your wealth ripped out of your hands and given to them while you are being forcibly prohibited from living your life as you see fit. They are actually afraid to live the life of a human being and don’t want you to live your life as one either. You guys are so predictable. Any scientist that says something cannot be ruled out as being caused by carbon you immediately jump down their throat and rattle on about the “peer review conspiracies”. Well, I defer to the scientists on such complex matters and they say the science is clear – that pretty much all the bad things or unecoected things that happen with the climate are linked to dity coal and industry. Why do you guys think you know better? I mean these scientists graduated from high school in the top 20th percentile of the year to get into a science degree. Sure, they partied harder than many faculties but in their rare moments of sobriety they learned that they could have a career in science by focussing their thesis on environmental issues and really important stuff like sustainability, biodiversity and global warming. Wouldn’t you do the same thing? I mean imagine you are an average science undergrad doing badly in “traditional” subjects like physics and chemistry which are, let’s face it, far too much work. Wouldn’t you choose the option of Savin the earth? Absolutely agree, it does seem that those that don’t understand science turn to evangelism ’cause that’s where the money is. Yea, so how is that phlogiston doing for you? Still sitting on a flat planet? With the sun revolving around you? Questioning is the start of intelligence. Blind acceptance is what the sheep do in Animal farm. My grades were better than the top 20th percentile and I choose science over engineering (still sobbing). That was a long time ago. You don’t need to pass high school to get into science, nor teaching, these days. I did a PhD and found out that my colleagues were smart but very dishonest. So were mine, well above (in maths and science anyway). Thinking where to go now. Have some funds, so I’m taking my time thinking about it. I just wish there was some surf ! I went into teaching to get a stable permanent job. Oh the horror! Someone said to me that if the kids don’t get you, then the other teachers will. After struggling badly for a while, I realised what was wrong and learnt how to teach. Easy! Had to quit though because the of the nastiness of my colleagues. Wow, i was just thinking about all the cyclones in my memory that have not even come close to Cape Range National Park. Basically the town of Exmouth for those living overseas. The Pilbara and the Kimberley is not even in the equation. I had much the same general question in relation to FNQ. If you ask anyone between Cairns and Ingham they will tell you they have had more than their historic share of recent cyclones. 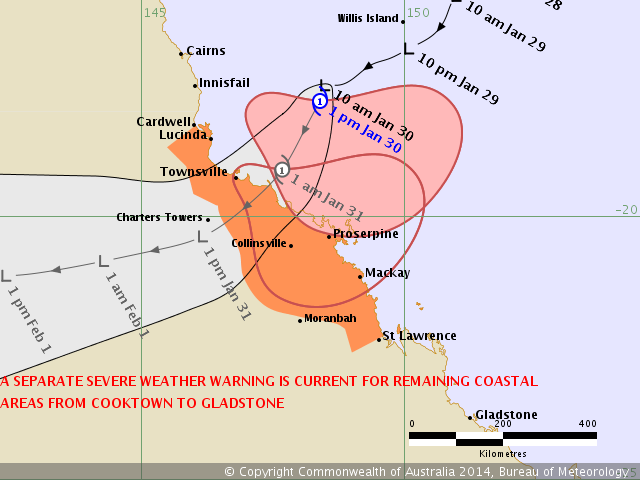 Cyclones used to occur as far south as Mackay and it’s been a long time since Cooktown had one. Perhaps the prehistoric record for a particular area doesn’t represent cyclone activity as a whole, and there is no normal distribution for cyclones. If we send you algore (for the Gore effect), can you send us your clowns? We need some hot air this winter! ‘Australia has lowest number of tropical cyclones in 1500 years?’ well that appears to going along with the current AGW theory! Because AGW produces more wind shear and this limits the full formation of cyclones. But when one does develop we end up with a more powerful storm than expected! Current theory? As apart from the Warmist’s theory previously that there would be MORE cyclones in Oz? Typical of you lot that constantly move the goal posts or simply make up the rules as you go along. Rules? Their only rules are “whatever you can get away with”, and “don’t get caught”, then, “if you do get caught hide behind a flood of uninterpretable equivocated verbiage that has been massively published by your pals and co_conspirators”. If that doesn’t work, the rule is “project every failing you have, every unscientific method you use, and every motive by which you run your life onto those who are attacking your ideas”. The goal being misdirection to tie up the conversation in irrelevant minutia while the politicians are stealing the wealth created by We the People and making it even more difficult for us to create still more wealth. But they do get caught, over and over again.. They just don’t care because the MSM will not publish anything against them. It never seeks to amaze me how it takes a minmum of 2 words to have propoganda. Yep everything that happens supports AGW theory. AGW theory is just the bees knees. I’ll quote that for you next response. Not as many cyclones- It’s happening already- it must be global warming- It’s worse than we thought! Good to see our resident court jester still trying to make us laugh. So AGW has been evident for 1500 years? That kinda invalidates your CO2 causation now doesn’t it? Just be careful when these new evangelists start offering to triple your money for merely sending in a donation when ordering their “free” publications. Bob Tisdale and WUWT have challenged Kevin Trenberth to provide a post at WUWT concerning his phantom heat playing hide and seek in the deep oceans. Wow what an opportunity to make the sceptics look like fools, surely he’ll jump at it? And i’m just as sure that pigs might fly. So Charles, would you be more in favour of becoming one of us if we were affiliated with a certain hygeine device? You would surely be wanting to become a sceptic then, if your previous comments are anything to go by. Let’s not be affiliated with the aforementioned products, I really have no intention of being associated with this guy. I can see the Archbishop of Canterbury urging him – “go on sire, defend that faith, they need you much more than we do”. This clearly is a catastrophic lack of cyclones. We’ve reached an untipping point. There is a growing lack of energy in the atmosphere. The Australian region seems to be experiencing the most pronounced phase of tropical cyclone inactivity for the past 550–1,500 years. A complete reanalysis of satellite data since 1980 (Elsner et al. 2008) confirms a global increase of the number of category 4 and 5 (i.e., the strongest) tropical cyclones: they found a 1°C global warming corresponding to a 30% increase in these storms. Who would dare to disagree with this science. Seems a bunch of upstarts working out of a small office in Geneva, do when they stated a few months ago that they had low confidence (i.e. could find no credible evidence) that increases in intense tropical cyclone activity would occur in the early 21st century. Alexander LV, Wang XL, Wan H, Trewin B. Using geostrophic wind speeds derived from eight triangles of sub-daily MSLP observations, we calculated measures of storminess for SE Australia for the period from December 1884 to February 2009 for all seasons. Over the period analysed, storminess has reduced in almost all triangles and seasons, but particularly in autumn and winter. Reductions are statistically significant at the five per cent level in nearly all regions and seasons. In terms of the average over SE Australia, both storm indices show statistically significant declines in all seasons. There is strong decadal variability in storm activity particularly in the early part of the record, with storminess peaking in the 1920s. Decadal variability in storm activity has reduced in more recent decades in all seasons. reduction in intense wind events across SE Australia over the past century, consistent with a southward movement of southern hemisphere storm tracks. These changes can not explain the significant reductions that have been observed in rainfall in the region but in tandem with other climatic processes it remains likely that reductions in storminess are influencing observed drought conditions. I will not believe this until Flannery, Steffen et al. confirm it and say it demonstrates imminent catastrophe. Further north, Bowen mango and tomato grower Dale Williams says the weather was quite mild and didn’t cause any damage. Only 50 millimetres has fallen at his farm since yesterday morning. “The wind in this area wasn’t strong enough to cause too much havoc. Two more cyclones could form around north Queensland in coming days, but are unlikely to pose huge risks to locals. Meanwhile widespread showers were pushing inland as a result of ex-Tropical Cyclone Dylan. “Areas such as Longreach will see showers in the order of 15 to 25 millimetres,” Mr Dixon said. ***Ex-Tropical Cyclone Dylan wasn’t completely benign, with one resort copping the brunt of heavy seas on Friday. Swells whipped up by Dylan washed away parts of Great Keppel Island Hideaway. 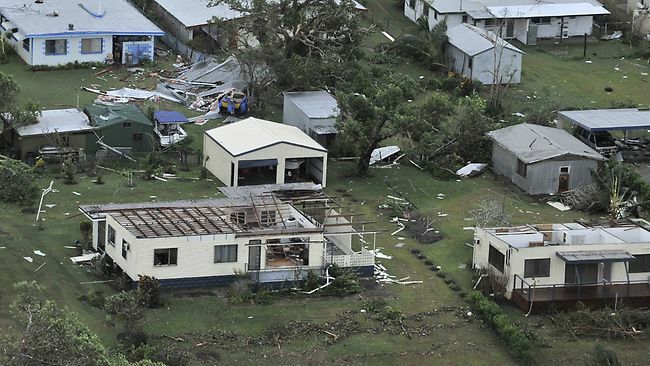 While residents on the mainland were breathing a collective sigh of relief in the wake of ex-Tropical Cyclone Dylan on Friday, Mr Appleton realised the worst was yet to come. ‘‘We’re expecting the houses to fall into the ocean with tomorrow’s high tide,’’ he said. ***naturally, all the pics are from the Great Keppel Island Hideaway resort. all this crying wolf over weather – what happens when there is a really dangerous bushfire or cyclone – who will believe any of it? sky weather channel still has Heatwave for every program today til late evening, and i’m still regularly seeing extreme temps forecast for the final days of the 10-day forecast, which disappear a couple of days later. Wasn’t it Ferenc Miskolczi (please excuse spelling if wrong) who said this would happen, showing Earth’s atmosphere to be inherently stable and not at all likely to have any run-away H2O feedback? Certainly removes the C from CAGW. leaving “anthropogenic global nothing much at all”. Actually, make that “anthropogenic global more plant growth”. First, that chart shows relative humidity, not absolute humidity. Warm air can hold more water vapour. If you warm the air and put only half as much extra water into the air as it could carry, then absolute humidity would have gone up while relative humidity went down. I’m just saying, you can’t use that chart to disprove AGW, you have to find other ways. Your comment about sea level rise is very relevant. The rate of sea level rise has followed world temperature. At the very least it shows natural variability in the climate is way higher than whatever effect CO2 is having from its “radiative forcing“. This is the best table I could find. I am guessing the data is for sea level air pressures but it does indicate that a change of temperature of about +5°C would appear to give a 10% drop in relative humidity. That’s good, but Wikipedia has an awesome one. The relevant temperature and pressure range for the most greenhouse-affected region would be -20…-30°C and 200…300mb, and unfortunately this chart doesn’t show that combination either, but… wow, just look at all those lines, this chart was made for printing out and putting on the wall to impress other boffins! But you may be right about the humidity. Even at -10 degrees it takes about 1.5 to 2.0 degrees rise to create a RH drop of 10 percentage points. The atmospheric warming was nowhere near that scale. It was more like 0.6 degrees. So probably there had to be a decrease in absolute humidity as well as some warming to get the observed 10pc RH drop. I have just scanned through the AR5 Synthesis Report draft and the word “humid” does not appear. Not even once. If they aren’t talking about it then maybe it’s bad news for them, so maybe you’re onto something. Sorry I’ll try that link to climate4you again.I hope it’s active this time. CLIMATE change guru Tim Flannery has stood by his call to act on UN predictions of rising sea levels, defying a NSW government verdict this week that they are too fickle for use in practical coastal planning. Professor Flannery, the former climate commissioner under the Labor government and a promoter of extreme visions of dire weather events, drought and flooding under global warming, now heads the privately funded Climate Council. The Weekend Australian put questions to him after the NSW government instructed local councils to concentrate on “clear and present” actual and measurable current coastal hazards rather than theoretical “doomsday” predictions. But the Climate Council defended the IPCC predictions. “Globally, sea level has already risen 0.2m, which has led to an increased incidence of high sea-level events,” it said. “Sea level is projected to rise between 0.2 and 0.8m by 2100. However, higher levels cannot be ruled out. The NSW government, in announcing its policy, noted a wide variation in observations and predictions. Owners of beachside homes in the Illawarra have welcomed a proposal to review controversial planning certificates they say have sent land values plummeting. Woonona resident Ross Kennedy applauded a state government draft circular, placed on exhibition this week, that seeks to overhaul section 149 coastal hazard notations but feared Wollongong City Council would not adopt the plan. “It’s a recommendation, not a directive, so it’s still open to the council to do what they like,” he said. “We have a group of good councillors but they have their own views on the world. Mr Kennedy paid more than $1 million for his Beach Drive home, only for it, and 18 others on the street, to be slapped with the certificates marking them under threat from predicted sea level rises…. In an overhaul of the state’s planning rules regarding the rise in sea levels, the NSW government will tell councils to separate immediate threats such as storms from longer-term threats caused by climate change. There have been complaints from some councils that climate change projections were impeding development, deterring potential buyers and sinking property values. Sea levels are expected to rise up to one metre this century, potentially affecting hundreds of thousands of homes and businesses along the coast. Mr Withycombe (Sydney Coastal Councils Group executive officer Geoff Withycombe) said state spending on coastal management, which had stayed at $2 million a year since 1979, was too small to address such issues. The new planning circular follows advice to the NSW Government from the NSW Chief Scientist and Engineer who examined this issue in April 2012. She in turn took advice from leading experts in sea level rise, CSIRO’s Dr John Church and Dr John Hunter from the Antarctic Climate and Ecosystems Cooperative Research Centre. The Coastal Expert Panel has also provided advice to the NSW Government to help refine its approach. “Nott says this latest study allows a comparison to be made between sedimentary and instrumental records and provides a “seamless record” dating back to about 1500 years. At one time, there was unanimous consensus for global cooling after 1940. The easy way to do a graph of anything cyclic is to get a sheet of graph paper, have an assistant pull it with uniform motion from left to right whilst the pen operator moves the pen up and down. Spikey bits require a more staccato pen movement. Voila! Lots of research time and money saved for real science. Off topic but the Australian Greens website at the moment has a spot where they invite the public to tell ” your climate change story “. I would encourage all concerned citizens to visit the site and tell their own story. Isn’t just reading their manifesto enough of a laugh? What’s the economic downside to cutting the size of soft drink and slushy cups? Off topic, but I don’t want Prince Charles to be King of Australia after today’s report in The Australian: PRINCE Charles has called people who deny human-made climate change a “headless chicken brigade” who are ignoring overwhelming scientific evidence. On 12 Dec 2012 Charles stated to school children in London the monarch he most respects is King George III – says it all really. I wonder in the near future we’ll have a movie titled “The madness of King Charles.”?, they could get Chris Burke to play him. Well, centuries of inbreeding does tend to addle one’s brain! Must of cut the wrong head off when the inbred was born. The guy claims to be related to Vlad the Impaler… AND he regularly visits Transylvania. Yep. I suspect the movement for Australia to become a republic will take a big leap forward if Charles ever becomes king. One flap of his mighty ears and all dissent will be swept away. That is not dissent being swept away Gnome,its fertilizer.As Charlie walks around talking to himself,his ears flap mechanically with every step.Worlds most efficient manure spreader. Unfortunately the (australian) Republicans are so that we will never be ready. For the last 20 years the only thing they’ve come up with is “we should have an australian Head of State”. Their level of “thinking” is all too similar to those of blackadderthe4th et al. None of them seem to have heard of the reserve powers or why they are there. Slogan chanters and oxygen thieves! If they’re (WWF) wheeling Charles out to prattle the pause cause, they just have to be profoundly concerned that things are not going so well. MSM peddling Charles-isms in the form of headless chickens is dicey. Dynamite and glass houses spring to mind. I’d have thought that this was almost guaranteed to help the skeptical cause. It simply doesn’t pay to draw to much attention to any association with Charles-King-in-everlasting-waiting. In any case, isn’t he an advocate for CO2 enrichment? He’s known to wander about talking to his plants, and believes that this activity enhances plant growth. I’ve just listened to the 10AM Radio News bulletin here. There’s a new Monster TC Edna (maybe low Cat 1 for a few hours if that) out in The Coral Sea, which will wreak havoc and destruction on Queensland if it immediately changes direction to the opposite way it is going now, and speeds up to Mach 2. There’s the possibility of another Low forming in The Coral Sea behind this one which has a 10% chance of forming into a Cyclone. There’s a Low forming in The Gulf Of Carpentaria which may have a 20% chance of spinning up into a Cyclone. There’s another Low off the Northern Coast of far North WA which has a 20 to 40% chance of spinning up into a cyclone. You may think I’m being a little sarcastic here, but this was actually reported in the bulletin, with the additional wording that all these reports are based upon modelling from the Bureau. It would seem to me that Queensland is about to wiped off the map, I’m afraid. I perceive a new Threat Warning level from the ABC coming up. Oh, except for every media outlet known to man, because they all have to rush a number of crews into the areas where this horrible devastation will be occurring. Judas Priest! How did we ever survive up until now? Apparently this site has a problem with understanding the difference between global and local. Nevertheless I am not aware of any IPCC report that has ever claimed an increase in the number of hurricanes. In fact one report said there could be a decrease, but they have forecasted an increase in intensity. New research is bearing this out. With property and life damage from the increasing bushfires is Australia’s South, and the increasing incidence of flooding in Australia’s north, suggestion that because the low incidence of tropical storms (which are only projected to increase in intensity with warming sea surfaces), we should not spend money to avoid the outcomes of climate change, is a bit poor, and certainly a bit partisan. Yes, tropical cyclones are not increasing everywhere. The devastation last year fell heavily in the Philippines. Sober analysis is what is called for, not this cheap partisan point scoring. You used to be a science communicator, Jo. This essay does you no credit. Then stop doing it ! Then this is my sober analysis: The climate comes with costs, and the changing climate with greater ones for Australian than many places, because of our vulnerability to drought and flooding. A smaller cost to avoid greater ones is good policy. An aspect of the climate that is not well tied to climate change, is rare enough that trends are still emerging, and may not even be increasing, doesn’t form a large part of the cost benefit analysis. Suggesting that it is why we are spending money to avoid is insulting to the intelligence of the reader and to the people who have lost family and property in climate related events that have increased in frequency: To honour them we should look at the increase in the frequency of flooding and fires in Australia and do what we can to avoid such loss in the future. And wasting massive amounts of money on ineffective answers to a non-problem is the height of economic idiocy ! As in Lab/Green policies, and the direct action plan. Look at the economic destruction of countries like Spain and UK, all due to the AGW renewable agenda. Craziness at its most crazy ! It is you that is insulting the intelligence of the reader with your fire and flooding mantra, which relies on the fact that we have just had the natural cycle of “flooding rains” and stupid councils have allowed building on flood prone areas and on the fact that the green anti-CO2 agenda has caused the cessation of cool season burn-offs that would protect from fire. How can someone write something so verbose but keep it so devoid of logic? Do you know that stupidity kills and it is bad taste to pass it off as intellectual? If you do not think that we if spend money that it will change the climate, it is not partisan to think that we can’t change the climate by spending money. Dam! Typing with my fists again. I think what Seth is saying is that changes to the climate will not be the same everywhere. Regionally different effects will be felt as the climate changes. For Australia our climate is currently changing to favor increasing bushfires and floods. Other areas are being affected differently. A simplistic ‘see storms in aussie are less (even though they were not projected to increase), so the problem does not exist’, is a non scientific analysis of the global situation. The longer we delay action the worse the problem will become. Taking action then is to mitigate future damage to a level that we can adapt to. What a load of BS !!! The real issue is that we are now heading downward, temperature-wise, and the general cycle is dry, getting drier, then a big wet. We have just had a naturally re-occurring big wet over the last couple of years, so the most probably rainfall outcome is now ‘getting gradually dryer’. Not more flooding. And by not having dams built in the right places, we will again suffer from lack of stored water.. that’s the stupidity of the greenie no-dams agenda. Waste, waste and more waste. As for fires, the only increase in severity can be landed squarely at the feet of the green stupid brigade for fighting against sensible practices of cool season burn-off, and the fact that many more people are now living in bushfire-hazard areas, often without taking proper precautions. If we cannot know what the changes to the climate will be and they will be different everywhere, then there is absolutely no way we can know if they will be any more difficult than natural climate change, assuming there is anything other than natural climate change. If it might flood more in England, and it might get hotter in Australia, or it might flood more in Australia, or it might get hotter in England, there’s no way to determine that the outcome will be bad, nor that it will last. Basically, the idea is that if the anomalies from the global mean temperature calculated at a specified time go in an upward direction, it will be bad somewhere. I cannot see from the IPCC report that there is any support for this, other than “it might”. It might cool off, it might get hotter, it might not change at all. Might is not a quantitative value. The “range” for temperature increasese goes from .5 to 3 or more degrees depending on the scenario (model). The rational, realistic response is to continue to improve our ability to deal with floods, droughts, etc just as we have always done. You are obviously behind on the science, please read the latest IPCC report AR5 on the physical science basis. Science tells us that CO2, a greenhouse gas, causes warming. We are increasing that gas, it has caused warming, far in excess of natural variation (which has actually averaged to produce a slight cooling). Actual observational evidence. The consequences of this are broadly well known, even though on regional levels there will be differences. If you look at some of their reports they have information on what directions different regions will head in as well. For Australia the West coast will get drier, etc. Globally all the indicators are consistent with the science, sea levels are rising, oceans are warming and acidifying, the Arctic is melting etc etc. Trends are also in the right directions, hot day temp records are breaking 3 times more often than cold ones and 5 times at night. Extreme precipitation events are up over 7% per degree etc. This is actual observational empirical evidence that fits the science and cannot be explained by natural factors. The intelligent, rational, humane and common sense action would be to stop as soon as practically possible the enhanced greenhouse forcing of our atmosphere before changes in climate overrun our ability to adapt to them. Also consider the people aspect to focussing only on adapting and not mitigating as well. Letting the climate get increasingly bad translates to more human tragedy and pain. Sea level rises are actually decelerating. They are not acidifying and they will never become acid. The little paper that showed a slight change in pH is so full of holes its ridiculous. The trend is towards cooling, has been since 2002, and now that the 50 year period of very strong solar maximums is finished, its gong to get a lot cooler over the next few decades. As for your continued references to common sense.. and education.. You cannot possibly judge on these, because you have neither. The actual measured observational evidence proves that you are lying. Please provide actual data and observational proof for your assertions. Only people on this site could turn a long term warming trend, the hottest decade on the instrumental record, 2011 and 2012 being the hottest la nina affected years on record, a long term ice decline in the Arctic and the Antarctica barely outside natural variation into a cooling trend. Amazing, you do Goerge Orwell proud. Care to actually provide some proof, or does that not fit into your kind of ‘science’. Massive rebound in the Arctic, Antarctic at record levels and still climbing. Only the hottest because the records have been so massively adjusted. Time to move toward the equator. You are welcome to move to Siberia, Canada, or Tasmania, if you really think its going to get warmer. But you won’t, nor will you cut yourself off from coal fired power and all the benefits it brings. When are you allowing a massive wind turbine in your back yard, or when are you going to buy into unsubsidised solar power. If you truly believed, you would do these things. But you won’t. Bet you holiday in a warmer area, unless you go skiing of course, plenty of that on offer over the next decades…. …..just ask the US if they remember what snow is. So .. put up or shut up… , cut yourself off all coal fired power.. do it now, or forever be a craven hypocrite. The Met office says there’s a pause, but long term trends do go up. All that means is temperatures are increasing. It speaks nothing to the cause. CO2 level is increasing. That just shows we are experiencing an increase in CO2 concentrations. Says nothing of the causality or relationship to the temperature increase. Why are you complaining about a short term trend being stated here when you’re busy harping on the TWO hottest years. NOT a trend, NOT relevant by your standards. At lot other sites address this, so your statement that only people on this site could turn a long term warming trend….is blantantly false. So one year and still way below the 30 year average is a rebound Griss? Seriously I cannot take you seriously. Sheri, you and your colleagues persist in calling single year seasonal variations trends while critisising other peoples use of the data. Please look at the long term trends for temperature, the Arctic, Land Ice and Sea Level. Ocean warming also shows a consistent and continuing warming trend. These are the long term records. Science tells us CO2 is a greenhouse gas that causes warming. Science tells us this will cause an energy imbalance in the atmosphere, cooling stratosphere, changes in the amount of infra red leaving the planet and changes in the amount of infra red returning to the surface. All been measured and are occurring. Science tells us that this warming will increase energy in the system that will melt ice, warm the oceans increase the temps etc. All are occurring. Science tells us that the oceans will acidify due to the increase in CO2. Measured and occurring. Scientists have examined, measured and calculated the natural variations and cycles in the planet and have determined that they are not the cause. So science, physics, observational and empirical evidence all line in a consistent and compelling basis that confirms and corroborates warming by man made increases in CO2. If you cannot see that then you do not understand science and are not looking at the evidence objectively. 30 year average.. why not go back to late 30′s or late 1800′s when reports indicate very small amounts of Arctic ice. Why do you insist on using such a short period , and a period that just happens to coincide with the natural warming cycle from 1970 which may have been one of the coolest periods in the last couple of hundred years. Why not go back to the MWP, or RWP..
Our current little bit of warming is nothing compared to either of them.. and unfortunately, its finished. Buy blankets or move to the tropics. … or are you already in the tropics. So where in any of the oceans is the pH <7 ? Are you, like most warmists, using the term 'acidify' because sounds scarier? Heeby–I used your rule about no short term trends. Don’t like your own rule, don’t use it. Use it and expect me to hold you to it religiously. If you use so much as a trend under 350 years minimum (since right now 1998 is 25 years, I expect you to double it or be quiet), you will be called out. Personally, I prefer all data start in 1900 and NEVER use regression to find a trend line. Of course, I don’t ever get what I want, so don’t be surprised when you don’t either. @HB – no, your statement is a lie. Evidence “supports”, it does not prove. Proof proves. Of which there is none. You flunked science 101, didn’t you? Grriss you call a one year event after a record melt and then critisise my 30 year satellite record? What natural warming period? Most major natural cycles have cooled over 60 years. The temp trend is over 120 years. The MWP is outside actual instrumental records but nevertheless by the scientific proxies were cooler than today, not global or uniform in period and had natural factors. Not the case today with natural cooling factors and global warming hottest on every continent at the same time. Actual science and data show that you are still making stuff up. Sheri since 1998 is 15 years. WMO definition of climate is 30 and generally accepted. I normally use 60 year plus to the end of the instrumental record. After that error bars increase, it is all proxies and natural factors that may have influenced the climate are not as well known. Nevertheless all data longer is consistent with the science. So the science, experimental evidence and empirical evidence is all consistent. How about acting skeptical and follow where the science is actually sending you. Philjourdan, what do you consider proof in a natural science? You flunked science 101. In the natural world everything is a balance of probabilities, the electronic revolution revolves around physics that is based in probabilities, does that stop your computer from working? When a theory is supported by the science, the experiments, the empirical evidence and observations then it is considered a representation of the real world. You are making an imaginary goal post that can never be met in this kind of science. There is no other explanation (and you guys keep trying) that matches the data, but AGW matches it perfectly. Someone once said science is a dictatorship and evidence is the dictator. the evidence says that AGW is a correct theory, currently occurring. Heeby–My bad. Blaming on my migraine. It’s 15 years, yes. Actually, I do like temperatures from 1982 on. They give a much flatter regression line than other data sets. Of course, I reject the notion that a regression line actually tells people much and that “global mean temperature” has any practical meaning, so the graphs are really pretty and probably impressive to those who can’t do statistical evaluations but love pretty graphs. All you have shown is the anamoly from the “global mean temperature” has increased less than one degree (far less) in the last 60 years. That has no meaning beyond said parameters. It does not mean the world is warming, only that the average is warming. Since the average is dependent on the number of stations, placement of the stations and any adjustments to the data, it has no real world meaning. However, if we say for the moment that somehow the average manages to be representive of a system that varies from +134F to -134F, it just means the mean is increasing. It speaks in no way to WHY that is happening. So, I do follow the science. You should try it, too. @Heeby – sorry Heeby – just because something is difficult does not change the rules. My statement stands, and your education is lacking. There is no proof. Period. Only in religion and idiots is there “proof”. There is evidence. And there is disproving. But not proving. You never took a science class did you? Either that or your teachers should be fired for incompetence. BTW HB – there is NO evidence that says AGW is a correct theory. Why? It is not even an hypothesis yet. TO get to THAT stage it has to be testable. No test has been devised. The evidence that exists say the Null Hypothesis remains in effect. Your ignorance of that basic scientific principal lays bare your ignorance on the entire subject of science, not just AGW. That is not me telling you. Those are facts. Science tells us nothing. It is not a deity, it is a method. The conclusion is nothing with out the data and arguments that support it, and still irrelevant if there is just one flaw. far in excess of natural variation (which has actually averaged to produce a slight cooling). Actual observational evidence. There has been no such evidence. Please do not do Science in Year 11. You would be better off in a career where you use your hands. If you have been living under a rock I coud forgive you. But I doubt that is the case. Over the last 60 years, the ENSO cycle has been basically flat overall. Your cherry picked year of 1998 was equal highest el nino event of the 60 years as well as that decade being predominantly el nino. The 2001-2010 decade that was hotter, was predominantly cooling la ninas and small el ninos, (but was still a hotter decade). Solar over that period has fallen. Volcanos over that period has increased in activity (they cause cooling), especially over the last decade (the hottest one). Cosmic rays have been going in the wrong direction to cause warming. The temps though have increased by 0.6 deg c, even Spencers satelite record. So you are scientifically and observatinally wrong on all counts. Please do your research before commenting again. Michael the Activist, is that you? I want your forgiveness? That is delusional. I have not cherry picked anything. Here is a plot of the results for linear regressions of the previous 10 years and the previous 15 years. This has been done for every month until recently. Do you not understand why you should have checked that cherry-picking line first? I don’t get the reference, Heywood. Michael the Realist (Aka Michael the Activist) was a devout warmist that polluted this blog for about six months, before he managed to put every mod and Jo off side with his constant repetitive rhetoric and his inability to acknowledge any other view but his own. He was finally moderated into oblivion not too long ago to the applause of many of the regulars. My post above was aimed at “Heeby jeebies” who ‘s style is starting to resemble that of Michael ie. Lists of apparent effects and repetitive links to NASA and NOAA. Thanks Heywood. I got the impression that HJ was reciting reading material from the Greens and was under the misguided belief that a suggestion to check some of these ‘facts’ would cure the poor little bugger. Cherry picking is using 1998 as the start of civilisation instead of the whole instrumental record, one of the strongest El nino events of 60 years. Cherry picking is selecting atmospheric temps alone when that is only where 5% of the added energy goes. Cherry picking is ignoring natural factors measured to produce a net cooling. Cherry picking is ignoring that 2011 and 2012 where the hottest la Nina affected years on record, and where 2001-2010 was the hottest decade on record on every continent. Cherry picking is only selecting the tiny bits of data that supports your bias while ignoring the mountain of science and data that does not. Sheri you are ignoring all the actual evidence and science while focussing on models designed to project future events under certain scenarios. There is much in the IPCC physical science basis that is focussed on data, science and observations. You are also cherry picking, and I suspect of an opinion blog and not the real report. Try and think for yourself. Cherry picking is ignoring my graph. All the linear regressions for possible end and start points (month rather than just year) are in the plot. Its not about cherry picking for the plot shows linear regression of data from the early 20th century. So what is it, heat hiding or still going up? A good example of cherry picking is not using data from your proxy post 1960 because it doesn’t line up with reality. If we throw out the model, Heeby, you have absolutely nothing but increasing mean temperatures. You really cannot understand that the climate science people have apparently taught their little minions that the models are not important. READ THE IPCC 5. It CLEARLY is based entirely on models. Without models, we know NOTHING about the future. NOTHING. I am curious how you and MIchael the Unrealist were so clearly brainwashed into thinking this was about models. Find me studies that don’t use the word “model”. Wait, let me save you time–if they’re in there, it would be such a small number as to have no significance whatsoever. Models are everything to the IPCC and climate science. No matter what the IPCC says, it’s not about the models. It’s COLD–ignore that. It’s a short-term trend. The sun didn’t do it. You can’t start at 1998 because of El Nino. Anyone else care to list some and save the trolls time? First, everything mentioned is models. Models are not reality. Second, the overall theme is–our models are very poorly constructed, we are missing crucial data to yeild accurate predictions, but if we want to keep our jobs, we’ll write what we need to. You do understand the 95% was vote, not real math. We know this because there’s no real math to base it on. Oh, and someone on this blog posted a fascinating paper on the last 1000 years of “extreme weather”–up to 1900, where instrumental records took over. Fascinating. Then I checked the “extreme” events since 1900 and found no increase in extreme events. If anything, a decrease. Often where the opposite was forecast by “experts”. Then I’m moving on to read the actual papers in the IPCC document. You know, it’s really interesting when you read the actual research and it’s not what the IPCC said it was. The level of certainty in the research is often left to the “exclusionary principle” or not stated. Maybe Heeby can tell me what happened to the 800 ppm or 2000 ppm in the past. How did we get down to the magic number of 258 that was taken as gospel by the climate change believers as the “proper” number. That would be helpful. Not sure how we got that high either, since there were no people at the time. But since Heeby is so well informed, I’m sure he’ll have an explanation. Heeby! Jesus fn christopher. How many times do you idiots need to hear that taking the WRONG “action” now could likely and easily be WORSE THAN not taking any “action”. Applying the Precautionary Principle is not a logical course of action. You HAVE NO PROOF of human caused warming. You HAVE ONLY A THEORY that humans could cause warming. You HAVE TO RECOGNIZE THAT POLITICIANS WILL PISS YOUR MONEY INTO THEIR OWN BOOTS if you let them have your money in the first place. You don’t understand science much do you. The theory of relativity is a theory, but its calculations make your GPS accurate, otherwise it would be sending you off cliffs regularly. Quantum mechanics is a theory, but our computer and electronic revolution revolves around it. Even gravity is a theory, as well as plate tectonics, evolution…well you get the idea. If you do not have a science background you should not be commenting on such a crucial subject. There is oodles of proof, read the IPCC report. The climate is not magic, natural factors are known and measurable, observational and empirical evidence fits the theory and no natural factors are occuring to account for them. There is little doubt. It has nothing to do with politicians, it is not in their interest to support this. It normally costs them their jobs and they don’t make profit bonuses like fossil fuel company executives do. Otherwise answer this. What did the labor party get out of supporting AGW? What did Turnbull, Rudd or Gillard personally recieve by supporting the science. Their is no logic or sense behind the political argument, the politicians normally try to ignore it. CO2 is a proven measurable greenhouse gas that DOES CAUSE WARMING, go back to school. So unless you have an actual rational, logical and scientific argument to put forward I don’t think I can help you anymore. They got into power for a few years .. thanks ONLY to a shoddy deal with the Greens and a massive broken promise about a carbon tax, which even now they refuse to allow to be torn up despite a massive thrashing in the election. So you have proven that they have gotten nothing but pain, yet still support it. So basically the corrupt government with the populace controlling fear machine is a load of crock. shelve that argument as it has no logical or rational argument and is destroyed by the observations. Its called far-left wing stupidity.. even now they won’t let go. DOH ! Heeby jeebies, you are the fool to such a high degree that I’m beginning to wonder what is missing in your DNA. Candidates come and go, elections won and lost but power still resides in the parties. You have demonstrated such a dearth of political awareness, I can only conclude you are pretending and/or possibly a cunning plant from the Party. No sane competent human could otherwise be so ignorant. You don’t get to shut down the discussion as you have tried and it makes it very suspicious that you have done so. Politics and financial gain is all that supports AGW. Whether by scamming to gain subsidies for “sustainable” energy when clearly they will never be “sustainable” or for grants to perform biased scientific “research” that remarkably always supports the interests of the grantor, you are in denial of the evidence. Frankly you are not competent with any analysis, either of the science or of the politics. Still nobody has come up with any rational basis for a political party or politicians to support AGW. The labor party lost power and even now still supports AGW as you admit. Why? They are a large political party in a basically entrenched 2 party system. It makes no sense, and they are not stupid, that is a pathetic reason. What benefit did Turnbull get personally from supporting AGW, he lost his job and yet still accepts it. Kevin Rudd lost his job and Julia Gillard hers, and they still accept it, what did they personally recieve by supporting AGW? Mark D your response is non sensical it does not answer any of those questions. There is only one logical explanation, they accept the science and are trying to do the right thing for future generations. Some people have morals and ethics, and others take the easy road and take the path supported by big business, big media like Murdoch and their fossil fuel supporters. It is also popular among the public because you are telling them everything is alright. Nobody like bad news. Please answer the above questions with logical realistic answers. A politician’s career is highly dependent on propaganda. Tony Abbott made a comment about a particular part of CAGW was crap and it was reported often that he thought that CAGW was crap (which I hope is true). We don’t have a Science Minister because the only scientist in parliament is a sceptic. An army of trolls (sound familiar) will come down hard on sceptics in the public sphere eg. Lord Monkton is not a Lord. Its idiots like you who parrot rather than think for themselves who need to be manipulated. Doesn’t answer any of my questions Vic. Why don’t you just admit it is an argument without basis, that you guys made up because everybody hates politicians and regulation. Gives a focus and a reason for your fake science. Fell free to give it another try if you can think of rational answers to my questions. Still nobody has come up with any rational basis for a political party or politicians to support AGW. They want to avoid the trolls in the media. With all due respect Vic that is not a logical or rational answer. Basically meaningless. Please answer the questions, because without rational answers your political interference basis of argument has no merit. Especially since non AGW accepting governments have not been able to effect any scientific organisations, that depend on them for funding, to change their stance on AGW, such as Canada and Australia. So again, in specific terms. The Labor party lost the election over it and their support for a price on carbon, but still supports AGW. What benefit did they get or are still getting? There is only one logical explanation, they accept the science and are trying to do the right thing for future generations. Some people have morals and ethics, and others take the easy road and take the path supported by big business, big media like Murdoch and their fossil fuel supporters. It is also popular among the public because you are telling them everything is alright. Nobody likes bad news. What benefits do big corporations and fossil fuel companies get by supporting anti science, think tanks, skeptic road shows, contrary scientists etc, and funding governments against AGW, like the libs and republicans? Big bonuses for executives and owners. Which individuals gain more, the Gina Reinhardts or the politicians like Julia Gillard by their respective sides of the argument. Be specific. I went for a science communicator job. The phone interview pretty much stopped when I said that I don’t play a musical instrument. I know that people like Heeby Jeebies are being paid to be trolls. Politicians know that they are out there and want to avoid bad publicity. How can you say Libs are Murdoch’s minions and Murdoch stands to make billions from a repeal of the carbon tax, but the Liberal MPs must believe in CAGW because they don’t say anything? Newspaper sales, Fox TV subscriptions and advertising are what make News a profit. Gina Reinhardt could afford to pay Gillard to be her maid. Julia Gillard got a huge pay rise, great perks, stunning pension when she became PM, and all she had to do was be prepared to lie about imposing a tax on carbon. Does anyone seriously believe that Labor ditched Rudd just because they didn’t like him? Heeby–Actually, in the US, the big oil companies support wind. They get big enough tax breaks on useless wind turbines to build NG plants with the savings. Who wouldn’t love a system like that? In fact, “Big Oil” is one of the biggest recipients of wind and solar subsidies. Why not? Neither work, you get that tidy tax break for building turbines and panels, and there’s absolutely no competition. In fact, the more turbines, the more NG plants. It’s a win/win. Tax breaks are wonderful things–and every corportaion out there takes advantage of them. What? You really thought “environmentalists” put up the wind turbines?? HA HA HA. Silly little person…..”Big Oil” in the US supports the liberals and environmentalists. You see, the end result of environmental rules are very lucrative for oil companies. Now, you could argue that coal is being hurt (like oil would care about that, right?) but another nuclear plant gets damaged and just like Germany, BAM, it’s back to lignite and forget emmissions. It’s a win/win for everyone except the energy users. My point exactly Vic. The actual rich people with trillions of potential dollars still stuck in the ground waiting to big dug up, are the real benefactors that are only interested in money. There was no advantage or big money or bonuses in it for Julia, Kevin, Turnbull or Labor and still isn’t. Julia said she supported a price on carbon the day before the election, and the proceeds of the carbon tax did not go to any politician or party. So bluster and wind and you guys fall for it hook line and sinker. Also no explanation why the scientific organisations here and in Canada have not changed there stance even though there governments are cutting funding and closing down the science on AGW and trying to GaGa any scientist that brings it up. Then try and extend that to virtually every national or international science org in the world that all accept AGW regardless of government type or leaning and your claims of interference and rich scientists collapse like a deck of cards. Think for yourself, you have proved that the argument has no legs, try another one. Come back when you can logically and rationally actually answer the questions. Gina doesn’t make money from coal, Heeby. Any extra costs to her business due to the carbon tax is comparable to what she gives away to charity. She was against the mining tax you twit. More of the Leftist foolery BS and absolute denial. NO bonuses for executives and owners. Ha Ha HA true colors showing there! The theory of relativity is a theory, but its calculations make your GPS accurate, otherwise it would be sending you off cliffs regularly. Quantum mechanics is a theory, but our computer and electronic revolution revolves around it. Gravity is a measurable force. What CAUSES it is what is theoretical the theory could be wrong and gravity would still be there. You should learn more about science before you inaccurately speak on the subject. Everything else you say is hand waiving, so unless you have an actual rational, logical and scientific argument to put forward I don’t think I can help you anymore. Tell you what, I’ll go back (to teaching), once you actually start wanting to learn. ! I can then teach you. You desperately need some education. Actually.. no thanks, I’ve had enough of trying to teach know-it-all dunces. Hypothesis: An idea, or an educated guess, based on observation. Normally a hypothesis can be supported or refuted through experimentation and more observation. A hypothesis can be disproved, by just one contrary experiment, or one non-supporting observation. A hypothesis can never be proven to be true. All science starts with a hypothesis. Theory: A hypothesis, or group of hypotheses that have been supported with repeated testing. A theory is only valid as long as there is no evidence to dispute it. Hence, Einstein’s famous quote, “No amount of evidence can prove me right, but just one piece of contrary evidence can prove me wrong”. A theory is therefore no more than a generally accepted hypothesis. Law: A law generalises a body of observations. A law explains an effect, that is always produced under defined set of criteria. If you release an object, from a height, within the Earth’s atmosphere, the object will move towards the centre of the Earth. That is Newton’s Law of Gravity. Which, by the way, has application with respect to any two masses, although at the time Newton defined his law, he did not know that. Note: In these scientific definitions there is no mention of “proof”, as an absolute. Proof is a legal concept, best left to Judges, who are trained and have the experience, to make a determination based on the weight of evidence. It has no place in science. Besides, Judges are sometimes wrong. So, based on these definitions, the hypothesis of Climate Change which, from a scientific point of view, only exists within the computer models, falls at the first hurdle, because the computed predictions have been shown to fail. And since you mentioned GPS’s, in connection with the Theory of Relativity, there is no evidence that your GPS will work anywhere else in the universe. In fact there is a hypotheses that the speed of light (and hence relativity) is not the same constant value throughout the universe. It seems to be affected by gravity, you see, so Einstein’s theory may have to change to accommodate this new knowledge, so even though there is a “scientific consensus” today, the text books may need to be rewritten. That is what science does. Now, what was that about you not being able to help us any more? Again, there is some EVIDENCE, there is no PROOF. Fail. You do not know science. Last year was Australias hottest year on record and globally it was about our 4th or 5th year depending on data set. Your comment cannot be justified with the available evidence. Basically you have just made it up. Science is about actual observational, empirical evidence not just making up what you want to be true. Yes, it was called the La Nina cycle, and observational evidence has shown that when we get wet we are getting more wet. Research using actual observational evidence has shown that extreme precipitation events are up 7%+ per degree. This year, our hottest year, was during a neutral ENSO, when our hottest years normally occur during El Nino events. So not normal, hotter than usual for current weather patterns and when weather patterns promote wet we are getting wetter. Drought increases the conditions for bushfires, especially when we have extreme precipitation events first that increase the available fuel. Rely on actual evidence and not on what you want to be true, thats what real scientists do. It was only the hottest ever (lol) in Bom’s highly adjusted. You do realise that in the global temp sets, the 1930,40′s have been adjusted downwards some 1.2C relative to now. No wonder its slightly warmer now. The adjustments account for more than the total global warming! As to cooling.. 3 of the 4 main data sets show cooling since 2002. The Pacific has switched to a cooling phase, and the Atlantic is following suit. That is evidence.. that’s what real scientists use.. Not like you and your brigade of ill-advised apostles. The world is starting to cool. Get used to it. lol, the old conspiracy theories, when are you guys going to grow up. Show me one global data set that has the 2001-2010 decade colder than the previous decade. Your cherry picking of start years is childish and not scientific and is not climate but weather. There is zero evidence for a cooling trend in any data set. 12 of the 13 hottest years on record have happened since 2000. THAT IS SCIENCE, actual data and observations. Please provide proof of cooling or stop making things up. You are bringing up natural cycles, which have produced a net cooling over the last 60 years, Sun, Volcanos, ENSO etc but the temps have increased by .6 deg c. So show what has caused the warming and actual evidence of cooling You guys persisting in calling opinion science is embarassing. When we can stop digging up the old data and finding the newer version doesn’t really match the older one. And the direction of the correction is always downward in the past, upward in the present. And maybe if there weren’t 4 or 5 “official” temperature sets, all of which are “adjusted”, it wouldn’t look so much like someone’s playing fast and loose with the data. Just sayin”. Again, If natural cycles can overcome CO2, then CO2 is NOT driving force and the theory that adding more will increase temperatures without bound is not correct. It may make the planet warmer for a period and not as cold for other periods, but it obviously cannot overcome nature. We will still have natural cycles and things will cool off, just as they always have. You disagree with the Met office that temperatures are not increasing? Or are you saying “level isn’t cooling” so we should be more precise in our terms? Or should we just say the warming is way below that predicted by the IPCC? Sorry that you don’t understand the nature of ElNinos. Not my problem. And as for cherry picking, even in unadjusted temperature data, 1960-1970 was probably cooler than most of the 1800′s so of course there was a rise since then, but that is invariably the cherry-picked starting point of the AGW fraudster. In unadjusted data, the peak of the 1930-40′s was actually just a tiny tiny amount lower than the huge ElNino peak of 1998. Why do you think so many records from the late 1930′s still exist. http://imageshack.com/a/img35/4914/haw6.jpg (Japanese data with RSS spliced on) Ignore it again if you wish to deny that the temperature records have been manipulated. But that 1930,40′s peak has now been extinguished from the temperature record. How fortunate for the global warmist priests who actually control those records. Hansen and Jones. Jones even commented in one of the climategate emails “we need to get rid of that 19040′s peak” .. and then it was gone. But you ignore this evidence of maleficence. No, you have been bought into the hoax big time, totally brainwashed with no hope of understanding reality. Well if you are worried about it warming up, move somewhere like Tasmania, or Siberia.. and don’t take any heaters with you.. I dare you. The Natural cycle of the Sun has been a Grand Solar Maximum over the latter half of the 20th century.. Solar activity higher than in many centuries, probably even higher than during the MWP, yet we didn’t get anywhere near the nice warm productive period that they experienced. All I can figure is that something was regulating the maximum temperature.. Maybe we were putting more radiative cooling gases into the atmosphere or something. And now the Sun has gone to sleep.. Cooling is on the way. Again that pesky peak around 1940, in this case higher than now. Read this, if you have the capacity to understand it. Grand Solar maximum for all the second half of last century.. gees why would that cause warming. Now unfortunately, sleepy time for old Sol.. and a colder time for us. Buy blankets, and hope you aren’t relying on solar or wind for electricity, because neither works well in freezing conditions. They are basically useless, actually. … observational evidence has shown that when we get wet we are getting more wet. So that is your hypothesis, is it? “When you get wet, you get more wet”, so when you get more wet, you get even wetter, and as you get wetter … ad infinitum. So as soon as a situation occurs were you don’t get more wet, your hypothesis fails, and fails totally. So it needs to be modified to allow for this. I know. Why not hypothesise that, “Getting wet, or remaining dry, is determined purely by chance”? That hypothesis will be accurate more often than yours, even though it is rubbish. When is one of these trolls going to learn to think, rather than just regurgitate from the prepared script !! Each of them worse, then worse, then worse… than the original. Griss and Sheri, your theories of conspiracy have no merit. Adjustments are a fact of science, no real life measurement data are unadjusted, that is childish and unscientific. Even Spencers satelite data is adjusted, and interestingly enough, most of the adjustments are to correct a cooling bias in his calculations. Deifferent areas use different measuring equipment, cover a different range, been taken on different times of the day etc etc. These are valid reasons and have been extensively discussed and explained by the organisations that do them. Also you have been unable to come up with a single valid, global, currently used and scientifically accepted data set to validate your claims. Please provide some actual scientific evidence to support your claims. If you cannot then you are saying that every data set in the world has been manipulated. This is a huge global conspiracy that has gone over several decades and likely encompasses every scientific organisation in the world, considering that they all agree with AGW. Do you have any evidence for that? Can you explain who is controlling all this data and scientific organisations and for what purpose? How have they been able to keep it so secret? Don’t just focus on Hansen or Jones, there are more data sets than that and individuals would not have that kind of power, Hansen does not even work for NASA anymore. Sheri, please check your math and your logic. Natural cycles have not ‘overcome CO2′ in any way shape or form. Please consider the facts previously put forward and that you have been anuble to comprehend. I will try to keep it simple. 1. Numerous peer reviewed papers have performed attribution studies on what has been going on in climate from a natural and anthropogenic sources. Every one of them have determined that when taking into account ENSO, Solar, Volcanos etc the last 60 years have produced a very minor warming to a net cooling. 2. I will repeat that for you as that is the bit you are not comprehending. The last 60 years natural cycles have produced a slight net cooling. 3. In those 60 years temperatures have increased by 0.6 deg c.
So far from natural cycles overwhelming the enhanced greenhouse warming, the opposite is the case. Temperatures HAVE INCREASED DESPITE NATURAL COOLING. This does not count ocean warming, cryosphere melting and all the other places the other 95% of increased energy that is building up can go. The atmosphere, which has increased by 0.6 deg c over 60 years is only 5% of the increased energy imbalance measured at the TOA. Impressive isn’t it. Would you like to rephrase your comment now? Go ahead Heeby explain how much of your .6 C is simply adjustments as this NOAA graph shows? Always upward adjustments. Statistically unlikely isn’t it? By the way, you are off topic. How do you explain the apparent reduction in extreme weather events around AU (like tropical storms) as Joanne has posted here? I have up above on both counts. Firstly adjustments are a fact of science, new information (some countries have only recently allowed access to their data), different measuring instruments, techniques, different times of day, different areas of coverage etc. Data is always adjusted to homogenise the data. Even Spencers satelite record is adjusted for numerous things and have had several readjustments for incorrect calculations for drift etc. All been explained by the organisations when they do it. Secondly, AGW means the global warming is global but the climate change isn’t. Besides the fact that the IPCC has never claimed that the frequency of storms would increase (they actuall said there could be a small decrease), each region is going to be affected differently. The article itself gives several possibilities. Other new research has shown that the intensity of big storms has increased. So nothing much to say, it is a non event that you guys are trying to typically make it into something it is not. As to your 15 years comments and statistics. Statistics out of context and on a cherry picked period is not science, it is barely called Maths, their is no analysis applied. IT IS fake science to confirm your bias based on computer graphics. Firstly it is to small a period to be called climate. Secondly you have ignored natural factors, including that you have started on an extreme El Nino, a period of increased volcanic activity, cooler sun, and a preponderence of La Ninas since 2000. Even then temps have not fallen, but have been maintained. It does not take a genius to realise that AGW is maintaining temps and that when cooling cycles flatten out or warm, we are going to go into a potentially damaging catch up period. This is also ignoring the warming oceans, melting cryosphere etc, which have continued through the 2000s. Care to apply a tiny bit of analysis to your comments and including all of the data and science for a change? Also Sheri stop trying to pretend you have read AR5 from the IPCC, it is clear yu have not. Oh do tell? So, please explain to us ignoramuses exactly how CO2 “is maintaining temps”. CO2 is a greenhouse gas. As a greenhouse gas it absorbs IR radiation being emitted by the planet as it is heated by the sun. It then reemits that radiation in all directions. In this way it slows the loss of IR to space which translates into a buildup of energy on Earth. This has been measured by satelites as a decrease of energy leaving the planet in the same bands absorbed by CO2, causing an imbalance of energy coming in from the sun to energy leaving. The planet warms to compensate for this imbalance. It has also been measured on the surface as an increase in downward IR in the same bands as that used by CO2. It is also noticed in the cooling lower stratosphere as less IR reaching the stratosphere. Therfore the planet has warmed with all the consequent side effects like ocean warming, sea level rising, ocean acidifying, cryosphere melting etc. So science matches measurements matches empirical evidence. Oceans are not on their way to becoming acidic so they are not acidifying. The claimed drop in pH was from 8.179 to 8.104, but the uncertainty in measuring those numbers is highlighted by other measures of the average pH of the oceans, 8.174 and 8.22, with only the latter to be taken half seriously. The whole idea that you could measure it is ludicrous. Much sillier than average global temperature as a pH probe can’t measure the pH of sea water with any useful precision, it changes with temperature and would require a prohibitively expensive large fleet of ships to actually measure. Ocean warming over a decade as measured by the Argo ‘Robots’ is about 0.1% of the uncertainty of each temperature measurement. That you claim it as evidence shows how little you know about science (or even reading the posts). Adjustments of data is subjective. Without the details of the adjustments, its faith not science. Considering that the numbers were adjusted to show more of a downward trend during the cooling scare and adjusted the other way for the warming scare, there is little good faith. The only precise measurement for the amount of ice is ice coverage, and overall, the amount of ice coverage is increasing. Please, no BS about how ice in Antarctica, that doesn’t get above 0°C, is decreasing in volume. Take it up with the experts, whom I think obviously know better than you. Science has been measuring the very small and very big successfully for a long time now. I notice that you asked for an explanation of how CO2 maintains temps, but have not commented on the actual explanation, just gone into the usual, ‘they are fiddling the data and don’t know how anyway ‘ style of non science conspiracy based rant. Care to comment on the science, are you more informed now since you did not understand it? Acids usually come in concentrations of a few molar. A pH of 8 is 10-8, and 10-6 M hydroxide (100 times more for you). So 30% of bugger all is still bugger all. Oyster farmers pump CO2 gas into their tanks containing oyster larvae. This makes their feed, algae, grow better and feeds the larvae. About 1200 pm that doesn’t harm the larvae but is optimum for the algae. That is how dishonest the NOAA is when they claim that dissolving CO2 in water creates acid so a higher concentration is acidifying the oceans. Oh dear, seems you also need remedial education in chemistry too. ! I will take actual science over your kitchen science anyday. “Until recently, we really didn’t think that having fewer carbonate ions would affect sea creatures for a century or more. Unfortunately, we were wrong. Late in 2012, it was reported that one particular sea creature was actually having its shell dissolved by the increasing acidity of the ocean. It’s the pteropod — a free-swimming sea snail that moves about thanks to wings like a butterfly. It lives for two years or longer and grows to have a shell about 1 centimetre in diameter. “Marine life that depends on calcium carbonate can no longer form shells or, in the case of coral reefs, skeletons. Such marine life are found in waters that are more basic with a higher pH rather than a lower pH, which is more acidic. Your ability to swallow nonsense without question is unending. We don’t have “actual data” on pH in the worlds oceans as far back as… say 300 years, (“Scientists” used a model to estimate pH 300 years ago). You think scientists have much chance of knowing what the pH of the global oceans was a million years ago? 300 million ? How much did the pH change between 59,290,000BC and 59,290,100BC? What was the rate that century? Don’t know, can’t guess, but it’s “unprecedented” now? Meanwhile natural unpolluted rain falls with the shocking pH of 5! Ban that rainfall! And pH in our oceans already shifts more on a daily basis at some sites than we are forecast to get in a hundred years of wildly alarmist modeling. Joanne, most of the articles and the science is based on actual measurements and observations of effects actually occurring. You know actual real science from scientists actually working in the field, measuring, studying and publishing peer reviewed science. I prefer actual science to your mere opinion, or could you point me to a list of your peer reviewed articles on climate change and ocean acidification please. This site is full of criticism of the quantification of what effect the absorption of IR radiation from the surface does to the climate. If you want criticism of your description then how about we start with why the energy absorbed by CO2 molecules is not transferred to the more numerous N2 before being emitted? And with regards to measuring the average pH of the oceans, here is what the NOAA have on the matter. An actual pH measure would require an experiment using the equilibrium of sulfur dioxide with sulfurous acid so you can’t just stick a probe on the Argo floats. It will be inferred from O2 levels. So the Nature article claiming a drop of 0.1 should not have made the claim as to what it is now, and made it clear that the small drop estimated from shells and models was not significant. Please Vic, actual criticism and a detailed explanation of what keeps our planet warm would be interesting and welcome. Stick to science please that has actual scientific support and not opinion, thanks. There are many studies and measurements confirming the acidification of our oceans, if you have critisism please place it in a peer reviewed paper critisising any of the studies above so that the actual scientific community can examine and learn from them. You obviously have basically zero idea about maths and science..
Let me guess, just out of high school ? I strongly suggest you enrol in one before attempting anything further to do with maths or science. or……. you could do social studies or psychology or something like, they mostly have zero idea of maths and science, so no extra study needed. Please Griss.. Don’t send him to engineering. We struggle enough with students with sub-standard maths, as it is! I think you are right about him doing the “social science”, the brain-washing seems to be mostly in place already. Please explain where I am wrong. With science and data thanks. Your attempts to belittle and bully to prove you have substance are unworthy. There is no substance in your response, just insult, which leads me to believe you have no answer to my argument. Thanks. I have no intention of wasting more than a few seconds of my time on someone who has zero intent to listen and learn. Go and do those courses I suggested, then come back in a couple of years. So you don’t know. I wish you guys would just admit it, instead of insults and excuses to hide your ignorance. Give it up Michael. We know it’s you. And your maths qualifications are ? If you like, I tutor senior high school maths… at $60/hr one on one. With your ability, we would be looking at many, many hours. Can you afford it on the dole? Ok, I will admit it. You are an idiot. That is not an insult, merely a description. Stupid idiot would be an insult. So, only insults? You guys really know how to act all super smart while not saying anything of substance or being able to comment on even the science you yourselves asked for. Insult all you like, it only proves how little you have. You ignore the arguments that correct you. You’re an idiot is all that is left to say. Hey Genius! Can you read? Again, I did not call you a stupid idiot. RIF – it is not just for children. Heeby: Not a conspiracy theory. Why is it warmists are incapable of understanding conspiracy theory. That would be “big oil funding”, stuff like that. No conspiracy here. Yes, all data is adjusted. However, technically, the problem that requires the adjustment should be fixed, NOT adjusting the data. There’s also the removal of outliers, IF you can justify it. I can’t come up with a “single valid, global, currently used” data set to justify my conclusions because there at a least a dozen. How do I know which ones you will like or not like? Also, every one of them justifies my conclusion, which is “the temperature anomalies from the mean global temperature have been increasing somewhat since the Little Ice Age”. I don’t see why you have so much trouble understanding that. All the sets work if you go far enough back. No, there are data sets out there that are not manipulated–it’s just really hard to come by them. I believe some have been retrieved through the magic of the internet and dusty books in universities. No one is controlling the data, though I am willing to bet you can’t provide a link to RAW data from anyplace. NASA, GISS, none. If you have a link, please let me know. I’d love to see it. Again, Heeby, with the insults. Really? You’re just sooooo cute. I know what the peer-reviewed papers say–I’ve read several. All are based on MODELING, not reality. And what goes into a model determines what comes out. It’s really that simple. Yes, again, the temperature went up .6 degrees and the scientists can’t account for all the factors involved so they blamed it on CO2. Yes, I get it. Hello???? Every single part of climate science is based on statistical analysis and models. Those trend lines you love are MODELS. I have ignored no factors–I haven’t even listed what I think causes climate change. I simply said climate science does not adequately or accurately model temperature projections nor does it account for all factors. Seems I am quite concerned about other factors. I did not start my “cherry pick” in 1998. I start as far back as the temperature record goes. Perhaps you are referring to Griss? Okay, I’ve wasted enough time on your pathetic drivel. I have more important things to do than respond to the cut and paste mentality presented here. Wow, just when you think the warmists are running out of parrots, another one arrives. Nice birdie, want a cracker?? Sheri, your argument ignores reality. You are talking about thousands of measurements in different countries and in different areas. You cannot suddenly change everything and make them all the same at the same time, and even if you did, the next week a new measuring instrument would be out. Your argument is non sensical from a scientific perspective. Just have a look at the reasons for adjustments I gave and think about how you could fix all of that. You could actually try a single data set. That would be impressive, rather than lame excuses. Also once you get past the instrumental data then you have the problem of data from proxies, so not even direct measurement is used. Firstly you cannot accept simple adjustments for actual measurements and then suddenly you are happy to accept as exact ice core data, tree rings, lake sediments etc. Seriously think about what you are saying. Also the uptick in temps occurred at the same time as we started burning fossil fuels, why can’t you understand that? You need a reason why temps have been increasing, the climate isn’t magic, it reacts to changes. What has changed to back up your argument? Not an insult, an observation. Your comments indicate you have not read IPCC AR5, which was specifically what you comented on. Have you? I will try to find that link, they make most things transparent and have explained adjustments, and oe of your colleagues provided a graph above. If he could provide the link to the actual explanation page I would be interested. Again a model is a projection under a certain scenario, that is averaged over time and cannot take in every natural event. When actual natural variation (sun, volcanos, ENSO) not predictable are entered the models are basically spot on. They were also spot on about how the planet would react to Mt Pinatubo. But the science is not based on them. The actual physics match the data and the empirical evidence of what has actually occurred. Please stop trying to hijack the argument because you cannot answer my actual premise based on science and the actual measurements and observations. The scientists have accounted for the .6 deg c rise, you just don’t accept the science due to your confirmation bias. Its not a ‘blame on CO2′, thats a misleading statement, it is what the science says and the data agrees with it. You do not ‘accurately model tamp projections’ (do you isten to yourself), go look up the definition of projection. The scenario is never going to match exactly, it means we have to emit the exact amount of greenhouse gases, aerosols etc as in the scenario, the sun will need to behave exactly as the scenario, as does ENSO, volcanos, land use by populations etc etc. You comments are nonsensical. I thought you start as far back as the little ice age? I have not cut and pasted anything that I am aware of. Every comment has been individually written and thought through. Who is doing the insulting? At least a dozen? but you still cannot name one? Here I will help you out. Roy Spencer, he has told senate how agw is crap and writes articles on how the science is wrong. But wait, the 13 month running average starts at -0.2 and finishes after 30 years at about +0.2. So 0.4 in 30 years is like .14 per decade which matches predictions and the trends in the data sets you ridicule. Also see the clear outlier of the 1998 extreme El nino clearly marked. Take it out and see the obvious ongoing trend. Response? or alternative sourced direct global data set from your dozen that show otherwise?